Cuddling, snuggling, embrace…there are so many ways to articulate how we can embrace another. It is something that is done in families, amongst friends and even between romantic partners to express a variety of things from comfort, to support and even a way to tick someone off (I’m sure there are some siblings who can relate to a fierce “hug”). One of the best things about professional cuddling becoming so popular is that we now have more ways to articulate how we can use healthy touch for a variety of people with whom our interactions may not be as instinctual (or as forgivable). In this vein, I would like to share 7 quick tips to cuddle like a PRO! Whether you are looking to become a Cuddlist or just model some healthy touch – these small tips will go a very long way…shall we begin? Whether you are cuddling with your partner, family member or professionally it is thoroughly important to determine what your motivation is and what energy you are bringing to this interaction. Are you looking to comfort someone? Looking to relax and unwind? Display affection to your child or spouse? With any of these, we bring the energy of that intention and it is important to make sure yours matches with the other person…which brings us to pre-talk. Once you have your motivation – chat it out with your partner. This is the perfect time to set up your parameters, likes, dislikes and preferences. This is also the time to chat about what your cuddle looks like. Is it hand holding? A hug? Do you plan to sit or stand? Is there anywhere you should be mindful of touching/being touched? Preferred pronouns (if you are not familiar)? What happens in case of arousal? What is the motivation for both (or all) of you? These are all things that increase your ability to be present and attend to both yourself and your cuddle partner in a way that opens the door for positive and effective communication. While it should go without saying, it never hurts to be reminded that hygiene is of the highest importance in any contact/proximity based activity. Being sure to have your teeth brushed, not putting on heavy scents (or generating them via body odor) and wearing clothing/jewelry that is not rough, abrasive or irritating to yourself or your cuddle buddy, will allow all parties to set the tone for the remainder of your time spent together. Remember – when in doubt – pull the breath strip out! Where to go, where to go? This is actually much easier than it sounds, because the answer is – anywhere! Seriously though, if you were to set up in a park, who is checking in on who your company is? This is another element that builds on motivation and pre-talk. Consider if you are indoors, outdoors, would you like music or are you more amenable to conversation. The opportunities are truly endless; however, they are much more enjoyable once you have prepared in the best way you can. Now that you have rolled these tips around your mind – the most important part is to feel comfortable AND confident in your cuddles. Once you show how comfortable you are – or even articulate how (un)comfortable your feelings are, you’ve made yet another step towards reinforcing your desired environment and session. As people, we can often sense when someone else is unsure/uncomfortable and take it to mean “we” did something wrong…and geez that would have ruined the progress made in pre-talk and setting. The easiest fix is to consider your partner is as eager/nervous/excited/scared as you are…how would you want to be treated? That’s a great place to start feeling a bit more comfortable and confident in your cuddling. Cuddling in any form can generate a great deal of vulnerable feelings while also bringing up things we may not add to the list of groceries, laundry and chores. When in doubt, appreciate your partner in an obvious (and respectful) way. This can be a simple “Thank You”, a pat on the hand, a referral or…feedback. I must say a good compliment never hurts; however, I eagerly await feedback. Ideally, you both will have given and received feedback throughout the entire session by checking in, communicating your needs and communicating through any transitions. Remembering that it is as much of a gift to give as it is to receive, be sure to really consider what it is you need, want and are curious about and how you would like to feel more supported. As you share this with your partner(s), also take in what they are saying – open communication highlights the path to more enjoyable sessions with whomever you are cuddling with! 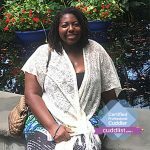 Desiree is a Professional Cuddler with Cuddlist.com and she is based out of Washington DC, Maryland & Virginia. Her skills & specialties are coaching, hypnosis & tantric rejuvenation. View Desiree’s profile and book a session with her here.